Georges Sada: "Kurds are Converting to Christianity..."
The international tour of Iraq’s greatest treasure, the Nimrud gold, should begin in Washington, DC, next February. The date was set in Copenhagen on 17 March by the Iraqi ministry of culture and United Exhibits Group (UEG), the Danish commercial venture organising the show. The Art Newspaper can reveal that the first venue for the Nimrud treasures is the Arthur M. Sackler Gallery, part of the Smithsonian Institution. Various formalities have to be completed before the exhibition is officially announced, in a few weeks’ time. There are likely to be around ten venues, after Washington, and these will probably include museums in Berlin, London and Paris. 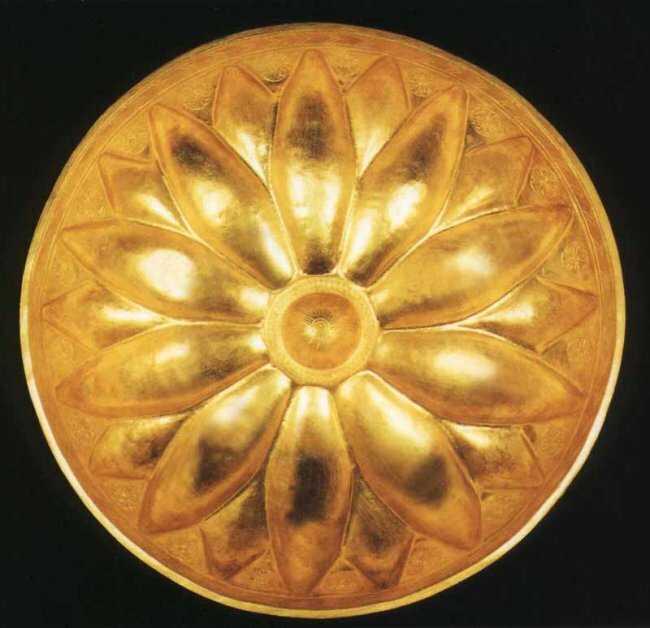 The tour of “The Gold of Nimrud” should raise around $10m for Iraq’s National Museum. The centrepiece of the show will be an accurate full-size reconstruction of the throne room of the Assyrian king Ashurnasirpal II at Nimrud. The site was discovered by Sir Austin Layard in 1848. British Museum archaeologist Max Mallowan (husband of Agatha Christie) excavated the throne room in 1950, but failed to locate the tombs of the queens. 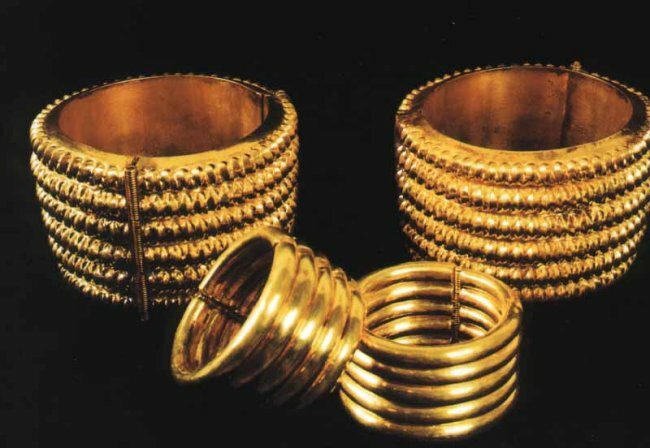 In 1991 Iraqi archaeologist Muzahim Mahmu found the tombs, with the thousands of pieces of gold. The treasure was then stored in the vaults of the national bank. Those who have seen it compare it with that of Tutankhamun. The reconstruction of the east end of the throne room is being made by Madrid-based firm Factum Arte. They have done this by scanning excavated Nimrud reliefs in the British Museum, Berlin’s Pergamon Museum, Princeton’s Art Museum, the Sackler Gallery at Harvard and the Dresden Museums. Despite initial hopes, it proved impossible to record the remains left on site in Nimrud and other fragments in Mosul and Baghdad, because of security problems. The reconstruction is being made in resin, and is almost finished. The latest news of the international tour comes after a series of false starts, but this is the first time that a specific venue and date have been given. We can reveal that the show was to have opened at the Arthur M. Sackler Gallery this June, but there were too many problems to be resolved, and a few months ago the Nimrud show was postponed. It has been replaced with “Facing East: Portraits from Asia”, which opens at the gallery on 1 July. There still remain a daunting set of challenges to be overcome before the scheduled opening of the exhibition next February. There are internal differences within Iraq on the touring show. The ministry of culture is keen, partly because it will bring in much-needed revenue. It has the formal authority and signed last month’s agreement. However, Donny George, former director of the Iraq Museum and now president of the State Board of Antiquities and Heritage, is against the proposal. Although not speaking publicly, he is believed to be concerned about the security risks and is also uneasy about the involvement of a commercial organiser, the UEG. Dr George is highly regarded by his museum colleagues in Europe and the US, and they would be reluctant to proceed without his blessing. Security is a difficult issue. Archaeological specialists are divided over whether it is better to risk the short-term dangers of moving the gold the few miles to the airport or the longer-term risk of leaving it in the Baghdad vault. The role of the UEG is also controversial. Most archaeologists would have preferred that the show was organised by a non-commercial organisation, but the company has proved adept and persistent in overcoming difficulties in a way that few international museums would be able to do. UEG staff have flown into Baghdad nearly ten times since the downfall of Saddam Hussein, at considerable personal risk. If the exhibition is to proceed, the full cooperation of the US State Department will be required, and this has proved more difficult than expected. US military protection would be needed to move the treasure inside Iraq and it would also require safeguarding while on American soil. Back in Washington, the Freer and Sackler Galleries have a financial challenge, since as part of the Smithsonian they do not have entrance fees. The exhibition will be expensive to mount—with payments due to UEG for their services, for the reconstruction of the throne room, and for the Baghdad museum. Sponsorship will therefore be essential. Although a blockbuster exhibition on Assyrian gold would be attractive for a sponsor, anything to do with Iraq is also politically sensitive. Finally, there are conservation issues. The gold itself needs relatively little attention, but some items incorporate other materials, which do need work. This cannot be done in Baghdad, in the present situation, and if conservation is to be undertaken in America, then the treasures will have to be flown out relatively soon. Dr Julian Raby, a former Oxford scholar and now director of the Freer and Sackler Galleries, is keen to “press ahead” for an opening next February, despite the challenges. Although he is only too aware of the sensitivity of the Iraq exhibition opening in Washington, he is determined that it should not be regarded as “spoils of war”. Dr Raby sees the show as “celebrating Iraq’s heritage”, presenting a very different picture from the constant news reports of death and destruction. He also regards it as an opportunity for the international museum community to “give something back, in terms of money and training.” The funds might well be administered through Unesco, and would be for the use of the museum, rather than going into the coffers of the Iraqi treasury. The situation is very difficult, but Dr Raby believes there are two choices: “Do you go into a bunker mentality or take the opportunity of the Baghdad museum being closed to do something major outside Iraq?” If the treasures are to be toured, he would like to see them go to institutions with Near East material, so the Nimrud gold can be seen in context and museums can help with conservation and training. Showing the treasures at kunsthalle-style exhibition venues would not provide the same benefits. The looting of many of Iraq's antiquities in the aftermath of the U.S. invasion three years ago made headlines around the world. For Marine Col. Matthew Bogdanos, the recovery of the priceless items became a mission that continues to this day. Bogdanos, 49, a Marine reservist who graduated from Don Bosco Preparatory High School in Ramsey, New Jersey was called to active duty after Sept. 11 and assigned to counterterrorism operations in Afghanistan. Bogdanos, who is an assistant district attorney in Manhattan and a classics expert with an advanced degree in classical studies, had the legal and arts background to lead the investigation into the looting of the Iraq Museum in Baghdad with a multi-agency task force. Bogdanos and others selected for the assignment were already in southern Iraq when the team was formed, and they began work April 2003. He has since served two tours of duty in Iraq, and to date, the investigation has led to the recovery in eight countries of almost 6,000 of the 14,000 known missing antiquities. "The museum had been closed for 20 of the previous 24 years," Bogdanos said. "It was open by invitation only." When war came, Special Republican Guard forces used the museum compound to harbor snipers and machine gun nests to fire on U.S. forces. "The Special Republican Guard, among hundreds of others, did the looting," Bogdanos said. "The thefts that can be traced to April 2003 took place within a space of 96 hours -- from April 8th to 12th." Among the pieces since recovered are the Sacred Vase of Warka and the Mask of Warka. The vase dates to about 3,200 B.C. and is believed to be the oldest carved-stone ritual vessel in the world. Task force members recovered it in June 2003, luring those involved in the theft to return it to the museum. In the trunk of a car with it were 95 other museum pieces. The mask is from 3,100 B.C. and was recovered in September 2003 buried in the back yard of a farmhouse in al-Rabbia, north of Baghdad. Known to be the first naturalistic depiction of a human face, it is priceless. Informants tipped off U.S. military police to its whereabouts. 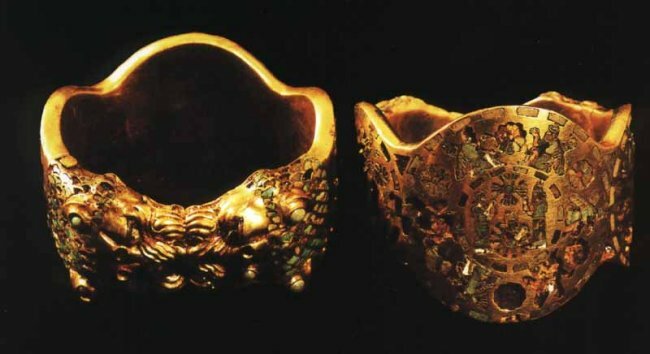 A basement vault in the Central Bank of Iraq held the gold crowns, bracelets, and rings of the treasure of Nimrud, an ancient city of Assyria south of Mosul, Iraq. 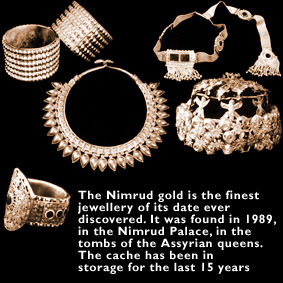 The Nimrud collection is compared to that of King Tutankhamen and dates to the eighth and nine centuries B.C. It has been displayed only once to the public, 17 years ago. 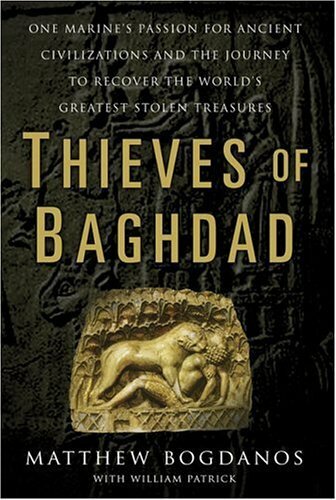 It was stored for "safekeeping" in the Central Bank, said Bogdanos, who also recounts his experiences in his 2005 book "Thieves of Baghdad," co-written with William Patrick. Bogdanos was in Afghanistan until April 2002, then in other countries until he entered Iraq in March 2003. He earned a Bronze Star for his counterterrorism duty in Afghanistan. He went home in November 2003 only to return to Iraq for 2004. Now, he has been tapped by the D.A. 's office for another unique task -- establishing New York's first task force to combat illegal trading of antiquities. Bogdanos has served as a criminal prosecutor in hundreds of trials, including the Sean "Puffy" Combs/Jamal "Shyne" Barrows club shootout in 1999 and the Baby-Faced Butchers trial of two 15-year-olds who in 1997 murdered a man in Central Park. Another trip to Iraq may be in the cards for him. "Iraq has sent a formal request to the U.S. government asking for me by name to return to Iraq to continue the museum investigation, develop a strategy, and establish an Iraqi nationwide antiquities task force to cover the entire country," said Bogdanos, who said he is likely to go back if the investigation is given adequate funding and support. Smugglers of antiquities utilize networks to evade law enforcement, and change patterns to avoid apprehension, Bogdanos said. "That is where we're seeing the involvement of the insurgents in Iraq," Bogdanos said. "Terrorists organizations are nothing if not adaptive. Hence the Taliban are using opium in Afghanistan to support their activities because opium is the cash crop. They don't have opium in Iraq. They have antiquities in almost limitless supply. Therefore the cash crop in Iraq now is antiquities." The money buys weapons and bomb-making material that they turn around and use on U.S. forces, Bogdanos said. "Antiquities smuggling, like weapons and drug smuggling, is a global criminal enterprise," said Bogdanos, who will return to Don Bosco to deliver a commencement address to 183 seniors on June 4. John Stanczak, the principal of Don Bosco, praised Bogdanos for his loyalty to his alma mater. "Not only is he magnificently educated in history, law, and the classics, but has used what he's learned here and elsewhere to make a substantive change in the world," Stanczak said. "Don Bosco for the first time in my life gave me structure," said Bogdanos, who maintains a summer home in North Jersey and whose three brothers attended the school. "There were three turning points in my life: the day my mother gave me [Homer's] 'Iliad' to read, coming to Don Bosco and joining the Marines." Retirement from the Marines is not an option for the multilingual Bogdanos, who was released back into the reserves in October 2005. "It's too much a part of who I am and what I am," he said. "You don't retire when we're in the thick of it. I could be here four to six more years -- as long as they'll have me. The British Museum has become the first national museum in the world to throw open its doors to a television gameshow. Codex, due next winter on Channel 4, is filmed in the galleries and Great Court, with a code-breaking finale in the Round Room, the former British Library reading room where Karl Marx and George Bernard Shaw pored over their papers. 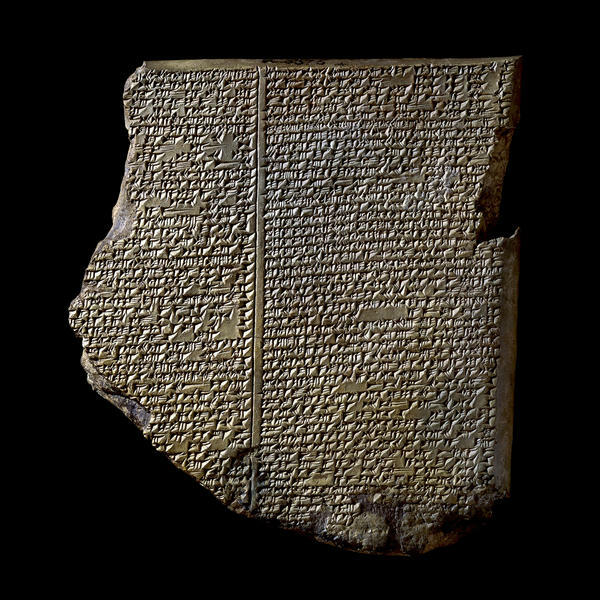 The Flood Tablet, relating part of the Epic of Gilgamesh in the British Museum. Already TV companies and museums around the world are watching with interest. The executive producer of the series, Roy Ackerman, said yesterday: "Our dream is to move on to conquer the Louvre, the Cairo museum, the Smithsonian." To the huge relief of the programme makers and the British Museum's director, Neil McGregor, a screening of the pilot programme for the staff proved a success. "How shall I put this delicately?" said Patricia Wheatley, broadcast adviser to the museum. "Some of our curators and keepers, absolutely brilliant academically, don't actually have televisions at home, so they'd never seen anything like this before in their lives. But they were among the most enthusiastic." The inspiration for the show, made by Diverse, whose recent hits include Operatunity and Musicality, came from the craze for puzzles following the success of the novel The Da Vinci Code. Each episode of the show is built around a period of history, starting with ancient Mesopotamia, and the series uses some of the museum's most famous artefacts, including the 2,700-year-old Flood Tablet, a cuneiform-inscribed clay tablet with an Assyrian version of the Old Testament story of Noah's ark. In the Assyrian text a raven, not a dove, fails to return to the great boat built by Utnapishtim. Museum archives record that when the tablet was deciphered in 1872 by George Smith, a relatively lowly museum assistant, his reaction was startlingly Big Brotherish. "He jumped up and rushed about the room in a great state of excitement and to the astonishment of those present began to undress himself." In each episode contestants will study real objects for clues to breaking the code. The show was devised by Justin Scroggie, who was behind Treasure Hunt and loves museums, but the idea came from the very different reactions of Roy Ackerman, the executive producer, who claims he hated museums. "I just felt these were the junk shops of the ancient world ... this series is trying to see if we can push the buttons of an audience who couldn't normally be dragged across the threshold of a museum." (ZNDA: Baghdad) Gathered in an auditorium in Baghdad's heavily fortified Green Zone, the 275 men and women of the legislature voted Saturday to approve a new Cabinet that the U.S. hopes will one day allow it to send home its troops. New Prime Minister Nuri al-Maliki is now the first constitutional prime minister of Iraq since the revolutionaries toppled the Iraqi monarchy and murdered the royal family in 1958. Every cabinet since then has either been imposed by officers, or Saddam Hussein, or the Americans. Maliki is the first constitutional Shi'ite prime minister since Fadil al-Jamali, who had been appointed by King Faisal II, in 1953-1954. Three crucial ministries - national security, interior and defence - have still to be agreed but new PM Nouri Maliki vowed to heal sectarian strife. Two Assyrians were selected to run the Ministries of Industry and Human Rights. Mr. Fawzi al-Hariri is Iraq's new Minister of Industry who represented a unified Kurdish block and Mrs. Wijdan Mikha'il is Iraq's new Mininster of Human Rights. Mrs. Mikhail ran on former PM, Iyad Allawi's list. Sarkis Aghajan Mamendu, Minister for Finance and the Economy, was born in 1962 in Diyana, Erbil Governorate. He was a member of the Kurdistan National Assembly. In the previous cabinet, Mr Mamendu was the Minister for Finance and the Economy from 1999 to 2006, and Deputy Prime Minister from 2004 to 2006 in the Erbil & Dohuk administration. Mr. Mamendu's duties will include: Preparation of the all budgets for the Kurdistan Regional Government; financial control of projects within the general budget of the KRG; issuing the financial stamp of the Kurdistan National Assembly (Parliament); observing and controlling the banks affairs and establishing the currency policy; providing licenses to currency offices; financial management of the properties and human resources of all the ministries and directorates; organizing, managing and implementing the customs tariffs; organizing the policy of exporting and importing. 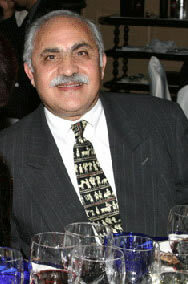 Nimrod Baito, Minister for Tourism, was born in Dohuk in 1952. He trained as an electrical engineer. and worked as an IT specialist with Hewlett Packard for ten years. Mr. Baito is the head of the Assyrian Patriotic Party. George Yousif Mansour, Regional Minister, was born in Kirkuk in 1952 and has a Masters degree in engineering. Mr Mansour was head of Al-Iraqia and and is the director of the Ishtar Television and was a senior advisor at the International Organization for Migration (IOM). Mr. Mansour's family lives in Canada. The following is the English translation of a report submitted by the Central Information & Cultural Bureau of the Assyrian Democratic Movement on 16 May 2006. Mr. Younadam Kanna says that the Principle of Organizational Monopoly and Exclusiveness of Power are not in Harmony with Democracy in the New Iraq. Mr. Younadam Kanna, the representative of the ChaldoAssyrian Suryani Christians in the Iraqi Parliament (National Assembly) and Secretary General of the Assyrian Democratic Movement (ADM), asked Mr. Nuri al-Maliki and the parliamentarian blocks to facilitate the formation of the new government. He stressed that the government must reflect genuine participation of Iraqi groups while taking into consideration election deservedness and vindication. He stressed guaranteeing the rights of all minority groups in selecting their own representatives to the Iraqi cabinet, as they are vital and authentic Iraqi components. Answering a question about the nomination of a minister from the Kurdistani Slate to the new Iraqi cabinet, Mr. Kanna stressed that the issue does not concern us. He added, “We are asking for the rights of Rafidain Slate to occupy a ministerial position because of its ethnic and religious uniqueness.” He criticized what took place in the formation of the Iraqi Kurdistan regional government when the Rafidain Slate, which truly represents our people, was marginalized, and that the desire of our people to select our own representative and to have consideration in election deservedness were not honored. The population of the ChaldoAssyrian Suryani Christians in Iraq is about one million. They are spread in the northern Iraqi governorates and in Baghdad, Anbar, and Basra. They were represented through the independent "Rafidain Slate" (in addition to other smaller slates) that won a seat in the Iraqi National Assembly. In the latest elections, the Rafidain Slate won the overwhelming majority vote of the ChaldoAssyrian Suryani people in the governorates of Arbil, Dohuk, in Iraq as a whole, and out-of-country voting as it competed against those other smaller slates. However, the "Rafidain Slate" was marginalized and excluded from participating in the Iraqi Kurdistan region government. The ministerial positions in the said government were assigned to ChaldoAssyrian Suryani individuals who are members of the Kurdistan Democratic Party (KDP) or others who are supporters of the KDP. Georges Sada: "Kurds are Converting to Christianity by the Hundreds"
(ZNDA: Washington) Retired Iraqi Gen. Georges Sada, a former fighter pilot-turned-Christian evangelist, says Kurds are converting to Christianity "by the hundreds" in northern Iraq. 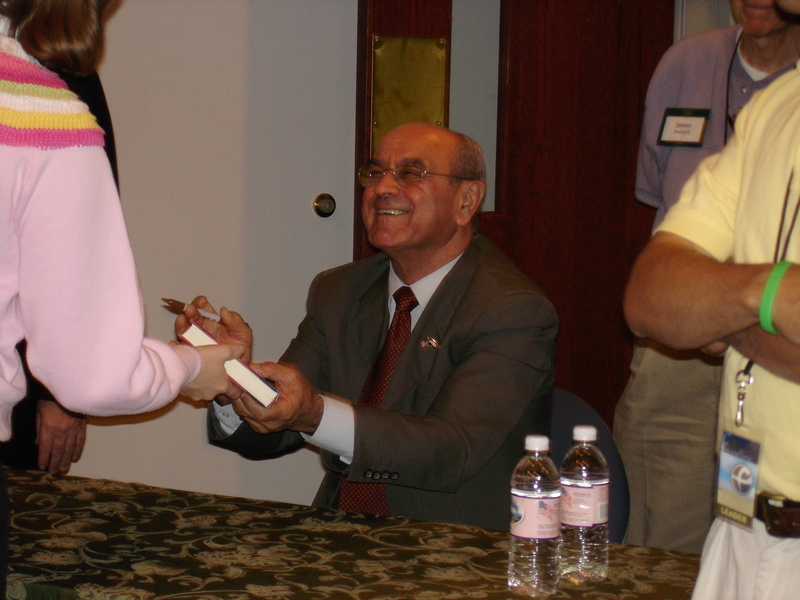 Gen. Sada signing his books on Monday evening in McLean, Virginia (photo by Stan Shabaz). Since the fall of the vicious Ba’athist regime in 2003, there has been an escalated campaign by the Kurds of Iraq for complete autonomy and a separate “Kurdistan” within the borders of Assyria, mainly in Northern Iraq. This is not a new phenomenon, as since the beginning of the 20th century they have been pushing for a Kurdish state in the international policy world, specifically in Northern Iraq (Assyria). The Kurds are one of the largest ethnic groups that exist in Iraq (mainly in Assyria). They are originally from the Northern Persia/Azerbaijani area (historians think, at least – not even Kurds are quite sure), the Kurds came down from their mountains and settled in Mesopotamia, where the Christian Assyrians, as they often do, left them in peace. And so they stayed. And how have their Assyrian hosts of the last few centuries been repaid? The Kurds have had their hand in countless massacres and even a genocide or two against the indigenous Assyrians (for a deeper look at these historical accounts, please refer to Nuri Kino’s article; "Kurdish Selective Amnesia & The Endless Genocide", and virtually anything written by Mr. Nineb Lammasu). The Assyrians (Chaldeans, Syriacs, and Aramaeans), although they are the original inhabitants of Iraq, Syria, most of Turkey and Northern Iran, are being marginalized as “insignificant”. They have been in these areas for almost 7,000 years. The Assyrians are direct descendents of the same Assyrians of the ancient empire – they have maintained the language (Modern Assyrian is from Aramaic – the Assyrians adopted the Aramaic language to due its easy writing style and efficiency), the culture, the geographical ties to their ancient land, and have managed to survive conquests by Persians, Mongols, Arabs, Turks, and most recently, the Kurds. Pick up any history book on the Middle East, and the word “Kurd” appears nowhere. The Kurdish envy of the Assyrian nation is understandable, and the recent verbal and written attacks against the Assyrians are certainly signs of a veiled Kurdish fear of the just Assyrian claims to their lands. The Assyrians have survived millennia of Arab, Turk, Persian, Western, and now, Kurdish attempts to destroy their national identity and do what they could to separate the modern Assyrians from their ancient ancestors. Since the Assyrians are truly the only ones who can claim virtually the entire Near East as their birthright, there is understandable and inherent jealousy. Pick up any history book on the Middle East, and the word “Kurd” appears nowhere. To the Kurds, the Assyrians are an annoying, unimportant aspect of Iraq, and since they can’t go back to their original areas of northern Persia/Azerbaijan to claim their “Kurdistan,” they have settled in Assyrian areas because Assyrians are easier to ‘deal with’. In other words, they won’t dare pick on someone their own size. Indeed, a breaking story out of Dohuk reveals they prefer to pick on helpless children instead. Let’s take a look at who the Kurds actually are. As is stated in the book “The Kurds of Iraq”, by Kerim Yeldiz, “the Kurds are native inhabitants of their land and as such there are no strict ‘beginnings’ for Kurdish history and origins.”  It is a convenient definition, as they can, with this claim, be inhabitants of “anywhere and nowhere” and can create “Kurdistan” anywhere they make up a majority. The Kurds originally come from an array of different ethnic groups over the last few millennia (everything from Mongol to Medes) and have ended up with a Turko-Persian language, Persian and Turkish culture, and hence, this is why they have the difficulty of truly knowing who they are and what their history actually is. Unlike the Turks, Persians, and Assyrians, who are sure of their history, the Kurds have the sad misfortune of putting together bits and pieces of what they believe to be true of themselves (even the Roma, or Gypsy, people have come to learn their origins). Of course, the upside to having an “empty history” is that you can make one up as you go along, especially if it benefits you financially and politically. The Kurds' newfound “nationalism” is an obvious and ludicrous attempt at a land grab in the newly chaotic and unorganized Iraq. The Kurds have also always carefully made sure that any policy of Kurdish autonomy included Kirkuk. Kirkuk, of course, has no historical significance to the Kurds – it is nowhere near their geographical origins, and it is certainly not a Muslim holy site. But it does have one thing – a lot of oil. Incorporating Mosul is also something that Kurds maintain is necessary in an independent Kurdistan; it lies in the agriculturally rich Nineveh Province. Kurds are (currently) a U.S. policy darling (we can thank Mr.'s Cheney and Wolfowitz for the 2002 plans for "Kurdistan"). They have managed to bully and butcher the Assyrians from their villages. They have stolen so much of Iraq’s oil wealth (with the help of the European countries who are actually signing oil contracts with the KRG) that they can afford to systematically begin buying their claims to Assyria: mainly by financing the Assyrian religious institutions to promote a religious, rather than ethnic, identity, encourage the division between the Chaldean, Church of the East, and Jacobite Assyrians, endorse academics and journalists to write about Kurdish “history” and minimize the claims of the indigenous Assyrians, persuade meaningless political figures like Sargis Aghajan to act as “Assyrian representatives” in the KRG, and finance Pravda-like propaganda machines like “Ishtar” Television. They are trying to undo 7,000 years of history with a few hollow token gestures. As if this hasn’t been tried before. But no matter what Kurds do, barely an inch can be dug in Iraq without finding another statue, buried city, or artifact that proclaims to the modern world that the soil belongs to the Assyrian nation, and always has. The lucky thing for the Kurds is that they have befriended the U.S. The unlucky thing for the U.S. is that they have befriended the Kurds. The Kurds themselves are not as unified as they may seem – Barzani runs a fragile government. The Islamic political movement in the Kurdish areas of Iraq is a well-kept secret, but a wildly popular one – both the Kurdish Islamic Union and the Islamic Movement of “Kurdistan” have popular support when one asks a random Kurdish student on the street, but due to the KDP’s threats of violence and bullying during the KRG elections, the Islamic parties do not win the majority they may have won otherwise. The West would be wise to reconsider allying with yet another Islamic society, as they prove to be unstable, undemocratic, and in the end, financially and politically disastrous to their own governments. The Kurds are enjoying their (short-lived) pseudo-victories in Iraqi Assyria due to their policies of murder and intimidation. They are counting on the short memories of their indigenous hosts, the Assyrians, and the indifference of the West to the gross human rights violations against the Assyrians by the Kurds (see “Continuing Kurdish Denial of Iraqi Assyrians and Their Plight”). General apathy in the West for the Assyrian issue certainly exists – but there is an underestimated intellectual community in the Assyrian Diaspora that is increasingly angry with the situation in their ancestral homelands. Assyrians in Iraq may be outnumbered, but the Assyrian Diaspora does not know how to sit quietly and watch. Like the Assyrians, the Kurds should be allowed to self-rule – every nation, should they so choose, should have that right. And should the Kurds find their history, and figure out which part of the Caucuses or Persia they come from, the Assyrians will surely be the first to call for aid from the international community to help these people find their way back to their true ancestral homelands. Please see “Is there an Assyrian cause in Iraqi ‘Kurdistan?’” by the “Diyako Xarib”. The author cites his source as “Kurdistanica.com”, for this very vague definition. The website also claims Assyrians are Kurdish Christians who have merely forgotten so. (ZNDA: Stockholm) On 29 October 2005, Yulius Isa Cicek, bishop of the Syriac Orthodox Church of central Europe, was found dead in a room at Hotel Sheraton in the German city of Düsseldorf. Police were called to the scene, and the Syriac Church was informed. The German policemen did not find any traces of violence on the body or other suspicious signs in the hotel room. 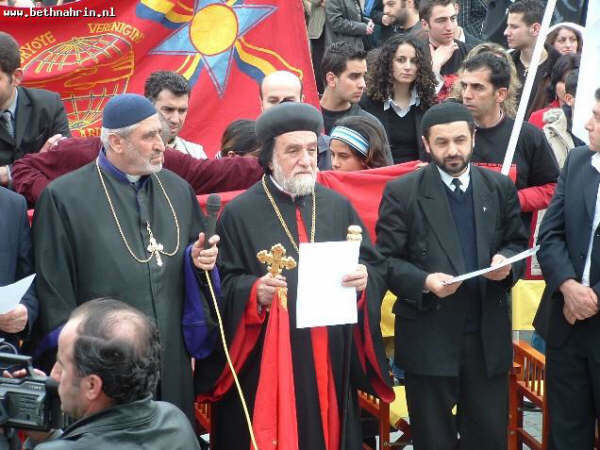 Bishop Mor Cicek (middle) became a contraversial figure in the Syriac Orthodox Church in recent years when he actively became more accepting of the Assyrian identity in his Church. According to official police conduct, an investigation is carried out only if there are reasonable suspicions of a crime. The German police, however, could have launched an investigation if the (Syriac) church had requested one. 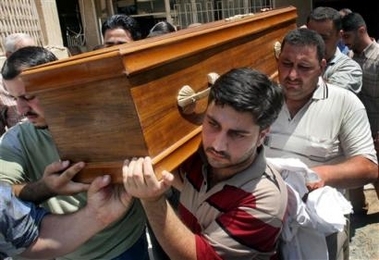 The German authorities informed the Syriac Church that an autopsy was available. Dr. Samir Afram, an Assyrian doctor in practice in Germany, was informed about the Bishop’s death, and quickly offered to arrange for an autopsy, but the church leadership did not reply to Dr. Samir’s offer, or to the offer of the German authorities. Nor were the German police asked to launch an investigation. The body was instead taken to a German doctor who issued a death certificate. The public by this time has begun asking questions about the Bishop’s sudden death. The church issued a statement that the cause of death was a heart attack, and that there was no reason to speculate. 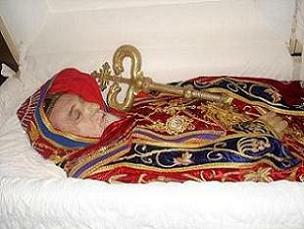 The clergy of the church immediately began planning the burial of the 63 year old bishop. Since then a debate has erupted about the issue of the autopsy. The leadership of the Syriac Church have issued contradictory statements. The church leadership has, at least once, claimed that an autopsy was performed. But the Patriarch’s representative in Holland, Khori Gabriel Aqaja states the contrary. Whether this confusion should be understood as a deliberate attempt at misinformation by the church or confusion regarding a death certificate and an autopsy remains to be seen. But for the people involved in the case it is becoming increasingly evident that no autopsy was performed. It is rare for the Syriac Orthodox bishops to travel without the company of at least one person from the church administration. Bishop Cicek supposedly took an early flight from Düsseldorf to Switzerland where he was invited to lecture at an Assyrian club. A Syriac Orthodox priest drove him to the Sheraton Hotel in Düsseldorf, near the airport. The priest tried to persuade the Bishop to spend the night in his home instead, but despite the fact that the priest lived not far from the airport, the Bishop insisted on spending the night at the hotel. According to the priest, Bishop Cicek hurried away towards the hotel entry as soon as the car stopped, as if he were late for an important meeting. The next morning he was found dead in his hotel room. Not surprisingly the Bishop’s death has lead to many conspiracy theories circulating among the Assyrian communities. He was an admired Bishop who contributed greatly to the publishing of many old and new books on the Church Fathers and other interesting topics. He had previously been opposed to Assyria and everything Assyrian. But in the years before his death he became increasingly cooperative and adapted a more accepting attitude. 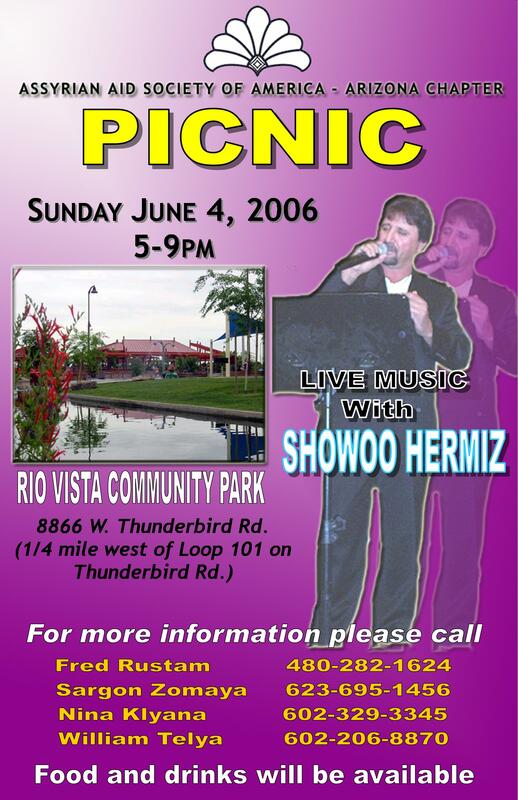 This was proven when he participated in several Seyfo events organized by the Assyrian organizations. Sabri Atman, the prominent Assyrian Seyfo scholar, had become one of the Bishop’s closest friends as they lectured together on the Assyrian genocide in many places. Mr. Atman, who has a unique insight into the death of the Bishop, has said that he is not yet prepared to share all the information he has on this issue. He has however written a series of articles in Turkish, about his friendship with Cicek and a background on the Bishop’s death in the Assyrian Magazine, Hujada. Mor Cicek laying in state. 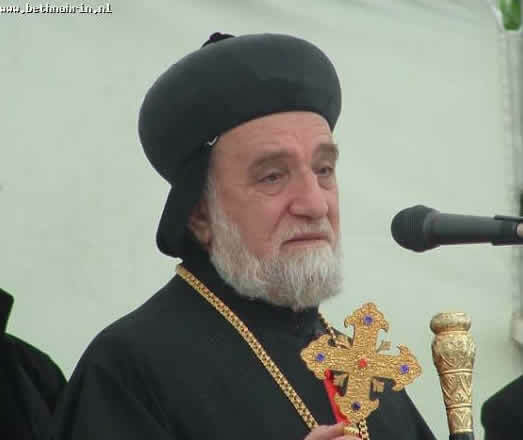 No official investigation of His Grace's death and autopsy was requested by the Syriac Orthodox Church. An interesting filmclip was released first time ever a few days ago (click here). In the clip, (filmed only two days before the Bishop's death) the Bishop is asked about his views on important issues regarding the Syriac Orthodox Church. The interviewer is Sabri Atman. This clip contains only a small part of the entire film. The rest of the interview, which is said to contain very important material, is to be released in the near future. The reason for this, according to the sources close to Zinda Magazine, is that time has not yet come for the explosive contents of the entire interview. In the film clip now available, Bishop Isa Cicek responds to questions on the Church's former hostility towards Assyrians, the Patriarch’s implicit statement that we (Syriac Orthodox) are Arabs, and the now famous Money Scandal. Bishop Cicek rejects and expresses sorrow for the statements of the Patriarch that Assyrians are Arabs. 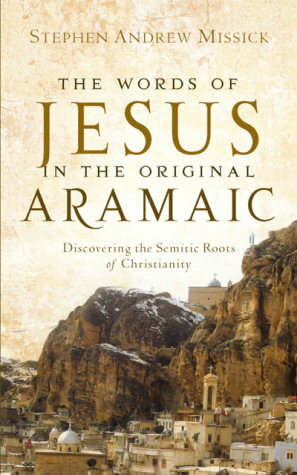 He also maintains that no Assyrian was ever banned from the Syriac Church. As for the money scandal, he points out that Bishop Augin Kaplan, the head of the Diocese of Western U.S., was responsible for the loss of millions of dollars. Bishop Kaplan, according to Bishop Cicek, was persuaded by an unknown group to believe that hundreds of millions awaited him in a bank account if he helped to acquire certain documents. The Syriac Orthodox Church continues to suffer greatly from the money scandal of Augin Kaplan who holds a record of controversial acts and is disliked by many for trying to Arabize the Syriac Church in the United States. The money scandle, into which also Bishop Cicek was dragged as he was trying to help his collegue, left Bishop Cicek with a bad reputation among his flock. Several persons close to the Bishop attest to his deep worries over the money scandle. Some of those who believe he died of a natural death think that it was those worries that gave him a heart attack in the hotelroom. After the death of Bishop Yulius Isa Cicek, his large Diocese of central Europe that included Germany, Holland, Belgium, France, Austria and Switzerland was divided. A power struggle broke off immediately between different groups, clans and clergymen over vacant seats. The power struggle still goes on. There are two discernible and important sides involved in this struggle – one side is opposed to the clergymen from Syria becoming bishops. The group opposed to the clergymen from Syria argues that most clergymen from Syria are influenced by Arab ideology and act as informants for Syria’s intelligence organization, the Mukhabarat. The death of Bishop Isa Cicek remains a mystery for an increasing number of Assyrians across the world and especially in Europe. People who were close to the Bishop maintain that he had no health problems and that he was not on medication, nor was he ill the day he was driven to the hotel. The age of the Bishop is another factor that feeds suspicion. Many people are not convinced by the formal death cause proclaimed by the church leadership. The conspiracy theories point to different individuals inside the Syriac Orthodox Church and the intelligence services of different countries. The skeptics believe that the truth about the death of the Bishop will open up the eyes of the people to what is going on in the Church and reveal gross misconducts that few are aware of today. (ZNDA: Melbourne) Jenny Mikakos, the parliamentary secretary for justice, has been accused of "hate speech" after telling Parliament: "Unlike Germany, which has taken responsibility for the Jewish holocaust, Turkey has never apologised to its victims." Ms Mikakos, who is of Greek heritage, told the upper house: "On May 19 the Pontian community in Victoria and around the world will commemorate the 87th anniversary of the Pontian genocide that occurred in present-day Turkey. "Between 1916 and 1923, over 353,000 Pontic Greeks living in Asia Minor and in Pontus, which is near the Black Sea, died as a result of the 20th century's first but less-known genocide. Over a million Pontic Greeks were forced into exile. In the preceding years, 1.5 million Armenians and 750,000 Assyrians in various parts of Turkey also perished." As two Labor MPs from Turkish backgrounds, John Eren and Adem Somyurek, called on her to sit down, Ms Mikakos, the member for the northern suburban electorate of Jika Jika, continued: "The Turkish Government must begin the reconciliation process by acknowledging these crimes against humanity. The suffering of the victims of the Pontian genocide cannot and will not be forgotten." Labor MP Michael Leighton has written to Mr Bracks urging him to ask Ms Mikakos to "cool it". "I find the various references to the Holocaust deeply offensive," Mr Leighton writes. "As the son of a Holocaust survivor, that is why I have no relatives on my father's side." Alison Crosweller, a spokeswoman for Mr Bracks, last night confirmed the Premier had spoken to Ms Mikakos but would not disclose whether he had asked her to apologise or stop making such comments. "It is a matter for her. She is expressing her views of something that happened 87 years ago," Ms Crosweller said. The secretary of the ALP's Coolaroo branch, Kazim Ates, has written to Mr Bracks accusing Ms Mikakos of "a cynical exploitation of the anti-Muslim sentiment that currently prevails in the Western world due to the threat of terrorism". In his letter, Mr Ates writes: "Ms Mikakos' speech racially vilifies the Turkish community and incites inter-ethnic hatred between the various ethnic communities that reside cohesively and peacefully as Victorians in our culturally diverse state. The Bracks Labor Government and the ALP have been promoting racial and religious harmony." Mr Ates demands that "Ms Mikakos should unreservedly apologise to the Turkish community for this act of vilification. Failing that, she should be removed as parliamentary secretary immediately." Ms Mikakos, who said last night her speech spoke for itself, told Parliament: "The Pontic people lived in Asia Minor and in Pontus from ancient times. When the Turkish nationalists took power after the collapse of the Ottoman Empire, a deliberate policy of creating 'Turkey for the Turks' was adopted, essentially to rid Turkey of its Pontian, Armenian and Assyrian Christians. "The process began with Christian businesses being boycotted, leading to bankruptcies and property being confiscated. Eventually, intellectuals and community leaders were rounded up and executed; women were raped and enslaved. Most victims died from exhaustion or dehydration on forced marches or work in the so-called labour battalions." The president of the Council of Turkish Associations of Victoria, Erkal Eken, has written to Mr Bracks urging him to dissociate the ALP from the "inter-ethnic hate speech". "All the Turkish community sees that she has to apologise," Mr Eken told last night. In an email to Labor MPs about what she describes as the "hysterical" response to her speech, Ms Mikakos writes: "Some Australians are mature enough to consider an apology to the Aborigines for the crimes of the past is an appropriate way of fostering reconciliation … That is all I was asking for." She called on the Turkish Government to acknowledge that the events took place. "Adolf Hitler is on record as justifying the Jewish Holocaust on the basis that no one cared about the Armenian genocide in the 1940s," she writes. 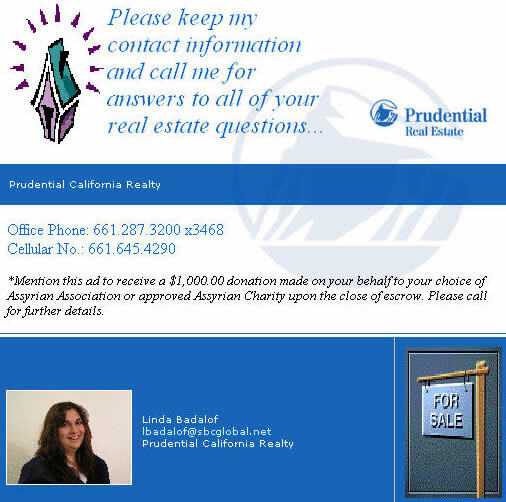 At the end of 1997, the Benjamin Adams Estate distributed money to six Assyrian tax-exempt non-profit organizations that were designated in late Mr. Adams will as residuary devisees. The will declared that this money was to be used for Assyrian children’s schooling and education and Assyrian refugee assistance. A much smaller additional amount was distributed to other organizations. This very serious allegation by Dr.Dadisho is erroneous and is not based on factual information. In addition to being damaging to the reputation of fine Assyrian organizations, his accusation is also deceiving and misleading the Assyrian public at large. As a member of the Assyrian Foundation of America and as the former president of the Foundation during the time that the Benjamin Adams funds were distributed, I would like to explain, to the public the manner in which these funds were disbursed. While I can only speak for our Foundation, I am aware that the other organizations named above have proper accounting systems and produce annual and/or quarterly reports..
A special account was created at the Foundation for the $ 280,000 under the name “Benjamin S. Adams Memorial Fund”. At an average of about $ 25,000 per annum, the disbursement of this fund occurred from 1997 – 2005. There was one exception in the year 2003 when we disbursed a total of $ 74,000. The 2003 war in Iraq caused the devastation of a large number of Assyrians creating a major refugee problem for our people. With the approval of two third majority of general membership, approval was given to the Board of Directors to disburse a sum of $ 50,000 for the purpose of assistance in this sad situation. Every dollar disbursed from Benjamin Adams memorial fund during the years 1997 – 2005 was used for the purpose of education and welfare of Assyrians worldwide and in accordance with requirements of the late Mr. Adams will. Our accounting system is very efficient and transparent. All incomes and expenses are documented properly with background support material. Our Board of Directors is held to a very high level of accountability. We take our Foundation’s by-laws very seriously and adhere to them. The Assyrian Foundation of America has been in existence for 42 years and will continue, with God’s help and with the financial support of our people, for a long time in the future.. The unanimous demand and good will of all Patriot Assyrians and Loyal to their Assyrian Nation is to put an end to division, and confrontations created recently, and reunify our beloved Assyrian Nation. We have lost the unity of purpose. Let us build for our Nation a feeling of oneness, of dependence on one another and of strength to be derived by unity. Those with strength devoting energy, those with knowledge giving advise. We must all make tangible contributions to the unification of our Assyrian Nation, and put an end to the national division and display the dignity, and honour of unified five million or more Assyrians worldwide. Unity is based on Patriotism and the Spirit of National independence. All Assyrians should link their individual destinies with destiny of our Assyrian Nation. We must consolidate the great unity of all Assyrians and carry forward its great spirit, it is very important for national rejuvenation. Solidarity and hard work among Assyrians in USA, Canada, Australia, Europe and Middle East is a source of strength to move toward rejuvenation. We have to make equal effort to consolidate the great unity and gather the whole nation’s strength for the beneficial of all. We must carry forward our National Spirit with Patriotism at its core so as to provide spiritual support to our Assyrian Nation and our Assyrian Churches. His Holiness Mar Binyamin (may his soul rest in peace) affirmed once the unity of our Nation in early 1900 until a Kurd assassinated him in cold blood. That strong unity was manifested by the moving solidarity of all Assyrians of different tribes, denominations or Church affiliation. Why can’t we do it today and confront Jalal Talabani or whoever is against our existence as an Assyrian Nation in Iraq? How can we Assyrians trust the Kurds when we are disunited? They are the same people that were confiscating our lands in North of Iraq by intimidating our Assyrian brothers to leave or be assassinated not long ago. Today they are unified under one banner and one name. They were 200 tribes with no culture, no history, and no common language, but today they became one. Learn my Assyrian brothers and sisters it is not too late. Those who aspire after great National Unity are Patriots and those who stand against it are traitors. It is as simple as this. This is a valuable aphorism as it clearly teaches truth of reunification and Patriotism to every Assyrian and encourages every one to work hard to achieve the cause of great National Unity. My dear people The Ashurayeh. God Ashur gave us His name and raised us up and treated us with special care and it is time we show Him gratitude, by unifying and become a Great Nation as desired by Him. The time for talking and arguing is over. 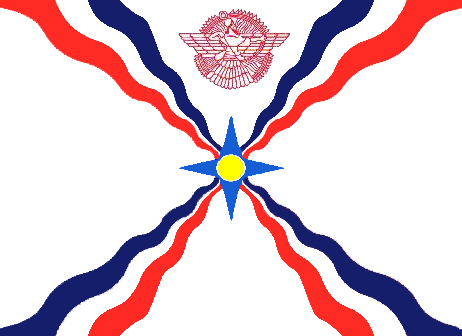 One Name Assyrians and one Flag represent the Unity of all Political, Social Parties and all Assyrian Churches. The trouble with our today leaders is they lack the ability to inspire us. We endure rather than exalt them. They neither guide, nor instill us with optimism in the future. We make our leaders into dictators, benign dictators. They answer to no one. This breads arrogance and corruption. All manner of political disputes that foment division and confrontation between our religious and secular Assyrians should be stopped and unity be achieved It is shame to notice Assyrians hurling abuses and slanders at each other. The Clan that is responsible for attacking every good Assyrian is often the clan most marked by corruption. Their attitude and activities are heretical and heinous; their behaviour is certainly not in accord with the selfless moral teachings they are supposed to expose. They are snob, corrupt by great and act in a very unchristian way. They are men of low moral. Unity should be achieved on the principle of promotion coexistence, coprosperity and common interests and subordinating everything to the cause of Assyrian reunification. I am hoping that the Church leaders and political parties’ self proclaimed petit leaders will listen and stop attacking the characters of their opponents. Where there is unity there is always victory. Thank you and God Bless Assyrian Nation. Do we want our last three-hundred-year history to be our destiny? Do we want to repeat the horrifying past? Motivators and history books teach us that every move we make and every decision we make today matters. What is more important is that because of the nature of life, many of these decisions or indecisions matter not only for you and me, but also for all of us. Our future generations will be affected by decisions, or indecisions, we make today. Because what we do today will decide the future for all of us and because we want the best for our people tomorrow, we must welcome criticism and accountability. No one should be excluded; no one is above the law. No one is better than you and I and no one is more Assyrian than you and I. No president, no patriarch, no bishop, no politician, no civic leader, nobody is better than you and I in the eyes of God. God created all of us in his image and gave each one of us a purpose, a unique purpose and mission in life. I am grateful that I am still alive today because I feel that my purpose in life has not been fulfilled yet. I hope that I will be alive tomorrow to fulfill that mission. I want to give my people the best and to do so I must improve and be better today than I was yesterday. To improve who I am, I must accept criticism with open arms. Criticize me my brothers and sisters, explain to me as your brother why I need to do things differently, convince me, but do not attack me because I am not your enemy. Let us get rid of the anger inside of us. Let us not live our days in anger and miss on what we could accomplish if we just learned to forgive. The truth must be said and if we truly care, we must welcome it because it is for our best. I do not hate you when I write that you did this and that wrong. In fact, I have decided to forgive you for all the wrong things that you stated against me; I love you, you are my brother. But, if you are dealing with the devil, I must remind you of that; I must remind you that there are many devils on earth and I must remind of those horrifying yesteryears Assyrians went through. If I have sinned forgive me, if I have made a folly point it out to me, and if you think that I am lost guide me, but do it like a big brother and sister looking after his/her little brother. We need each other; we have only each other. The devil wants our demise; please do not put your hands in his. I am here, put your hands in mine and lets prove to the world what these two siblings could do. Lets help each other to be the best we could and together we could help Assyria shine like no other. 2nd International Conference: "Research on the Church of the East in China and Central Asia"
To give the opportunity to discuss ongoing research, e.g., on certain topics or texts, in separate workshops. No general theme shall be suggested on part of the organizers, the concrete programme will depend on the proposals of the participants. General introductions into or discussion of jingjiao are discouraged. The languages of the symposium will be English and Chinese. The organizers will provide board and lodging free of charge. The Conference is organized by Prof. Peter Hofrichter, Salzburg (Austria) and Prof. Roman Malek, Sankt Augustin (Germany). 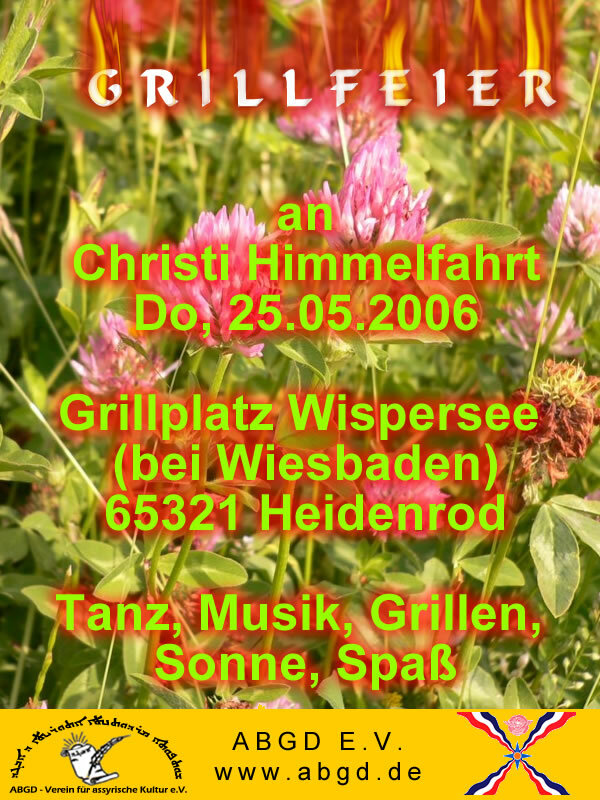 It is sponsored by the Austrian Federal Ministery for Education, Science and Culture, by the Foundation PRO ORIENTE, by the Monumenta Serica Institute in Sankt Augustin, by the University of Salzburg, and by the "Bildungshaus St. Virgil", Erst Grein Straße 14, A-5026 Salzburg, where the Conference will take place and all participants will stay. For more information and list of speakers click here. 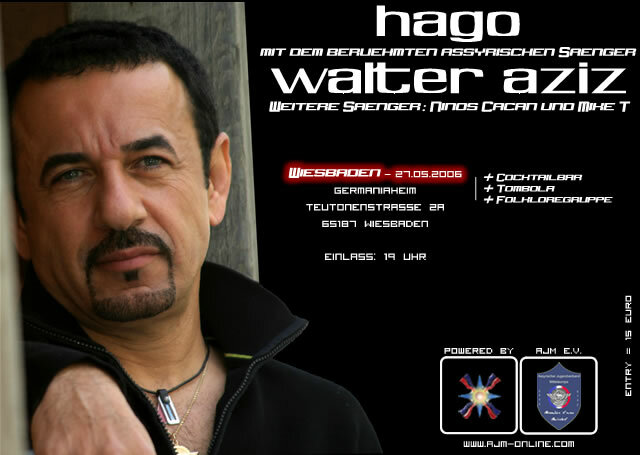 compilation of twenty years he spent as the editor-in-chief of Radio Qolo in Sweden. Gabriel Afram’s work in journalism offered him unique opportunities to travel to far places and encounter fascinating personalities. Reflections on events of varying degrees, letters and sketches of travels are sandwiched in 118 pages in Swedish and 122 in Assyrian, along with some 50 photos. People with an interest to learn more about the federations in Sweden, including the Syrianska and the Assyrian federations, will find Reports a good source for analysis. The book was originally written in Assyrian. 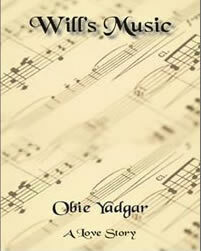 The Swedish translation of the book which includes the works of Gabriel Afram’s long time colleague, Augin Kurt. Reports sheds light on the contemporary Assyrian history, a topic of interest for many readers of this publication. Gabriel Afram, continues to inspire and illuminate us with his latest work, The Reports. For orders write to dolabani.kf@glocalnet.net. Los Angeles' "Belle of Baghdad," Iraqi actress Yasmine Hanani is starring in "Blockbuster! The 9/11 Commission Report (2001)," a dramatization of events leading up to the attacks of September 11. Hanani, the 25 yr-old actress who appeared in Albert Brooks' "Looking for Comedy in the Muslim World," portrays Aysel Senguen, a dentistry student and the wife of Ziad Jarrah, one of the four terrorists aboard Flight 93. Hanani recently competed as Miss Iraq in the Miss Asia USA Pageant, held in Southern California April 29. Blockbuster! is being presented in four segments showing the key players and their actions year by year, from 1998-2001, relating to the events leading up to 9/11. The final segment starring Hanani is to be presented May 31st at the Nakano Theatre in Southern California. This segment follows the efforts of U.S. officials in 2001 to determine responsibility for the Cole bombing before striking al Qaeda within Afghanistan, all in the context of a new U.S. president stepping into office. As the fresh administration tries to understand national security concerns, al Qaeda operatives enter the U.S. to commence final preparations. The segment climaxes with highjacked airlines crashing into the World Trade Center and the Pentagon. All Americans know what happened on September 11, 2001, but few are aware of the events that took place prior to the attack as detailed in the U.S. government’s The 9-11 Commission Report. "Blockbuster" makes vivid how the attack grew from concept to reality, while America and its allies attempted to fight back. Works in Progress presents Blockbuster! The 9/11 Commission Report (2001) at Nakano Theatre, Torrance Cultural Arts Center, 3330 Civic Center Drive, Torrance, on Wednesday, May 31, 7:00 p.m.
Works in Progress presents the original epic work Blockbuster!, a dramatization of events leading up to the attacks of September 11 presented in four segments showing the key players and their actions year by year. All Americans know what happened on September 11, 2001, but few are aware of the events that took place prior to the attack as detailed in the U.S. government’s The 9/11 Commission Report. Blockbuster! makes vivid how the attack grew from concept to reality, while America and its allies attempted to fight back. The final segment follows the efforts of U.S. security officials to alert the new Administration to the serious threat posed by al Qaeda in 2001 and the mounting evidence that a catastrophic attack on the American homeland is coming. As the Bush Administration tries to put its policies in order, Osama bin Laden pushes hard to execute the planes operations. Tickets ($15 adults, $13 students / seniors) are available at the Box Office (310) 781-7171. Parking is free. For information, visit http://www.torrancelive.us/ or call (310) 618-6342. Works in Progress is a program of the Cultural Services Division of the Torrance Community Services Department. We urge with extreme outrage all peace loving nations: The United States, Great Britain, Australia and all other Coalition member governments in Iraq, to intervene with the Kurdish Region Administration, to prevent further provocation attempts aimed to spread hatred and division among the ChaldoAssyrianSyriac people. The Kurds are out to eradicate the “Assyrian” identity by inclusion of the new label“ Kurdish Christians”. Over the past thirty five years , thousands of ChaldoAssyrianSyriac families have left the country escaping Saddam Hussein’s brutal dictatorship and lacking human rights order. Nearly, half of the villages and lands have been destroyed and forcefully abandoned. Today, after a new democratic government and parliamentary life is established in the country, a new ordeal of dimensional fear and persecution is spreading in the Northern Region where the Kurds are attempting to consolidate their authority of Federalism dream. The current policy Stops nothing short of Kurdification of the region’s non-Kurdish population. Throughout the past years of struggle, ChaldoAssyrianSyriac people have been a loyal partner, with the Kurdish, in their joint mission to free the country from the evil grip of Saddam Hussein. Our people have suffered tremendous losses in property and life of its citizens. Now that the evil is gone forever, we have every constitutional right to enjoy the same privilege and freedom that the Kurdish have today. We have the right to elect our own representative, teaching our language and maintaining our sacred rights in culture and tradition. No body has the right to speak for our people except our officially elected Representative. This must be made clear to Mr. Masoud Al-Barzani, that we share the same suffering over the years, our both people deserve some rest and peace of mind. Continuation of hostility in the region will benefit nobody, the logical way is to forget the old tactics of “Divide & Rule” Leave people alone to breathe and enjoy the new blessing that God has given us together, in the region. Banning of discussion on the progress of Assyrian Schools in the region – or elaborating on any given education programs. Banning to announce or allow news about the Assyrian Aid Society programs in the region. Allowing repeated mention of “Kurdish Christians” instead of the ChaldoAssyrianSyriac identity that won during the Iraqi Elections in december, 2005. I'm just a phone call away! Today, there is a lot of communication and activities between the Assyrian/Chaldean Church Leaders and the Kurdish Regional Administration. From what we can understand, by closely watching Ishtar TV, operating from Erbil, Iraq, both Patriarchs – Chaldean and Assyrian Church of the East, seeming as indirectly embracing the new name calling in the region. This strong assumption emerges from the silence of both churches by not protesting the denial of Assyrian identity. We would like to refresh the memory of the world leaders, The United States, Great Britain and other Coalition members who participated in the freedom process, that the ChaldoAssyrianSyrian identity was strongly considered as an acceptable option to all concerned during the writing of the Iraqi Preliminary Constitution. The historic Assyrian Conference held in 2003, all existing Assyrian Political Parties, including the Chaldean Patriarch, with all other major Christian church leaders, endorsed the declaration of a Unified Identity. Unfortunately, few months later, both Patriarchs sent individual messages to the Central Government rejecting their previous commitment to the new Identity. Recently, in Iraq, the Chaldean Patriarch even went further to denounce the possibility for a Chaldean faithful to claim himself as an Assyrian. Statements of this nature coming from important Church leader, at this particular juncture, is a clear indication of endorsing Kurdification process in the region. In other words, our Church is accepting the new “ Kurdish Christian” identity, unwillingly. We the ChaldoAssyrianSyriac people do hereby declare our strongest disapproval, and utter disappointment at the facts and allegations coming out from the North of Iraq. We protest such unlawful practices that are especially coming from some, historically oppressed people, whom we considered trustful Allies against our joint Enemy of the united Iraqi people. As to the question of our Church and its respected leaders, we call upon them to STOP interfering into the people’s political life. Clean your own house first, and restore your lacking respect and dignity among the faithful. Uphold the proud recommendations to REFORMS in the Church, and recognize the Lord’s call for Unity of its people. 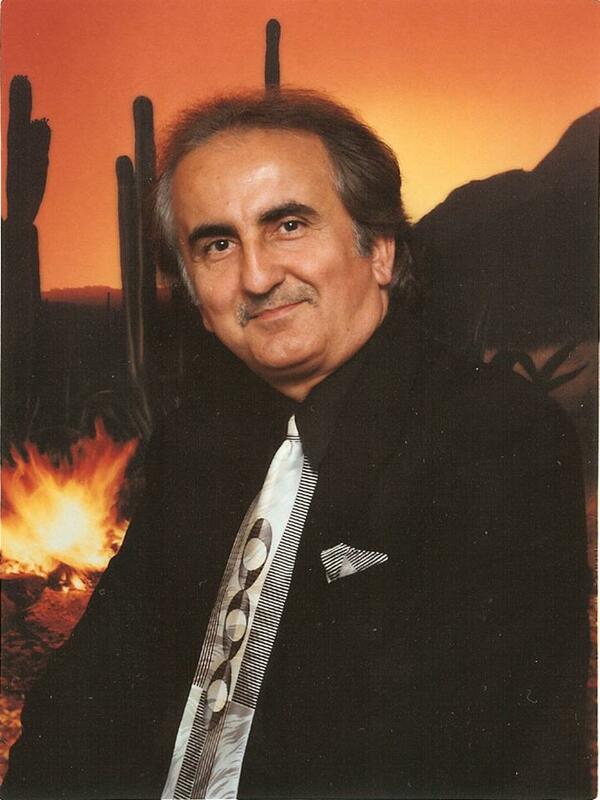 On May 20, 2006, Ashur Satellite TV presented an interview with Dr. Lincoln Malik, the founder of the Assyrian Democratic Movement (ADM) in the United States and Canada. Mrs. Jacklin Bejan conducted the interview that lasted for about an hour and a half in Syriac language. I have placed the essence of most of the questions raised by Mrs. Bejan in my subtitles here. The following is a rough translation of what Dr. Malik conveyed to the viewers. I have used additional information and placed them between brackets when needed and moved certain statements around in order to consolidate certain issues addressed. The topics of the interview centered mainly around the events of the last few weeks in Iraq, the formation of the Kurdistan Regional Government (KRG) in northern Iraq and the new Iraqi Central Government, and the continuous interference of the KDP in the internal affairs of our people. Dr. Malik begins by stating that what happened in northern Iraq with the formation of the KRG is not something between the KRG and ADM or between all Kurds and the ADM. What happened is in reality a struggle between the Kurdistan Democratic Party (KDP) [of Barazani] and our people and nation. There are many people who are under the impression that the ministerial seat that we had in 1992 was a seat handed like a favor by the KDP and Patriotic Union of Kurdistan (PUK) [of Talabani] to the ADM. That is not the case. What happened after the uprising in 1991 turned the world's attention to northern Iraq and to Kurds in particular. The Kurds got an opportunity to govern in the region. They needed to show to the world how they would rule: democratically or autocratically, and how would they deal with the other groups in the region. Here, we had elections, and both the KDP and PUK, and especially the KDP, formed their own slates to compete over the five seats that were assigned for our people. The KDP even printed the Cross on their election campaign pamphlets. By doing so, they tried to insinuate that they were not only representing the Kurds but our people as well. In those elections, the ADM entered with a separate slate. Remember, in 1992, the ADM had nothing, minimum power, no media resources, or money. Still, the ADM won four out of the five seats, meaning, 80% of our people's vote. It is for this reason that the ADM earned the right to have a ministerial position in the first cabinet and parliament in the Kurdish region in northern Iraq. It was the way for the Kurds to express to the world that they were democratic. Dr. Malik asserted that the ADM won 85% of our people's total votes in the latest elections; however, the KDP denied our rights by appointing Nimrod Baito [Youkhnna] in the KRG. We have to ask, who is Nimrod Baito [of the Assyrian Patriotic Party (APP)], who are calling themselves today as Atranaye (patriotics)? Using such title as Atranaye is deceptive; it is a façade to hide behind. Nimrod Baito is one of the Ba'athists orphans of Saddam Hussein. These were the people whom when Mar [Eshai] Shimun did not approve with what Saddam had asked from him to do [in early 1970s], Nimrod Baito, William Shawil, and others established jabba d' nokhama d' Atour (Assyria Ba'ath Party) and worked under this title until 1991. They had connections with the authorities that empowered them. These same people were the reason to imprison many of our people. After 1992, they changed their names to Atranaye [patriotics]. The KDP is showing a strange policy in dealing with Ba'athists. The KDP claims that 180,000 Kurds were killed in the Anfal operations; however, they bring Ba'athists to become representatives of our people. Nimrod Baito is like a zero at the left of a number and as we know a zero at the left of a figure neither increases nor decreases the value of that number. Not only that the KDP is shoving its finger in our people's eyes by not honoring the recent elections results it went further when it handed this person a position that is a tease. If anybody out there believes that there is a Ministry of Tourism in today's environment and conditions in Iraq, that person is living in a fairyland; he/she is blind, deaf, and dumb and knows nothing. Our nation is an educated nation, it has a history and knowledge, and we can differentiate the good from the bad; we will not be outplayed. Such persons are not our representatives and the KDP cannot shove this poisonous morsel or scrap of food in our throats. The KDP could appoint whomever it wants and to any position, but the KDP cannot force Nimrod Baito as a representative for our people. Dr. Malik stated that choosing Nimrod Baito and Fawzi Hariri was how the KDP made sure that our people had no representation in the executive branches of government in both northern Iraq Kurdish regional and central governments in Baghdad. What the KDP did was to have a "Christian" [Fawzi Hariri] as one of its nominees to the Iraqi new government, knowing that the Shia'a Muslims would have an issue with allowing more than one Christian in government. This is how the KDP made sure that our people had no chance to have a true representative in the central government. Here we see clearly that the KDP interfering directly in the affairs of our people and not in the affairs of the ADM, because if in December 2005 our people had elected a different slate to represent them in parliament, the KDP would have still done the same thing. People are mistaken when they assume that this is a new struggle between ADM and KDP; this is a historic and rooted struggle between the KDP and our people and nation. The KDP is trying to undermine and marginalize the political and national rights of our people on our ancestral lands. Fawzi Hariri is the son of the late Franso Hariri, who had repeatedly stated that he was a Kurdistani and that we live in Kurdistan; therefore, we were Kurdistanis as well. He was a Central Committee member of the KDP, an organization that in its political agenda never recognized our people's national rights. The political agenda of the KDP is to gain the rights of the Kurdish people. So when a member of our people has succeeded to reach this high ranking position within the KDP and calls himself a Kurdistani, what could our people expect from such individual? It would be interesting if Fawzi Hariri came forward and explained where he stands and what he represents since he is a member of the KDP and had called himself a Kurdistani. Sargis Aghajan and the Money Spent on "Christians"
The KDP is using Sargis Aghajan and others like him, who sold themselves to the highest bidders, to interfere in our internal affairs. We are Christians and Jesus teaches us to "beware of false prophets, who come to you in sheep's clothing, but inwardly they are ravening wolves." These people are not here to serve our nation; they are here for their personal glory and reasons. We must remember that Jesus teaches us how to identify these false prophets when he says that: "…a good tree bring forth good fruit; but a corrupt tree bring forth evil fruit. A good tree cannot bring forth evil fruit, neither can a corrupt tree bring forth good fruit." We must see what are the real fruits of Nimrod Baito, Sargis Agajan, Fawzi Hariri, and others who have become a bridge for the KDP that uses them to interfere in our internal affairs. We could see that their pathetic actions have been a set up. Sargis Aghajan is busy building churches and churches halls. The question is, would Sargis Aghajan come out and declare to us his political agenda towards our nation. How does he define our nation's rights? What is his vision to achieve these rights? Where does he stand in the struggle of our people at this particular moment? Let Aghajan tell us, how our rights would be achieved by being a member of the KDP, because if he satisfied our curiosity and convinced us, we will all become members of the KDP. But Aghajan knows that he could not answer these questions because he is a false prophet. One cannot block the sun with a sieve or strainer. Sargis Aghajan, KDP, and orphans of the Ba'athists Saddam Hussein could not block the sun's light with their strainers. We must not give these individuals more credit than they deserve. When one buys another, he does not sit and try to reach a mutual understanding. He pays the person and gives him the orders; such individuals have sold their nation and themselves. We must remember that this is not something new; we had Tariq Aziz and William Shawil before. What mutual understanding did these had with the Ba'athists? This is similar to what Judas did as he betrayed Jesus with the 30 pieces of silver. What mutual understanding did Judas had with the chief priests and elders besides taking the 30 pieces of silver and wait for the right moment to deliver Jesus? These are not any different than Judas; we must learn from our history. Dr. Malik stated that it is a fact that we lived side by side with the Kurds for a long time. We will always have part of our people living with the Kurds. Today's struggle is not between our people and Kurdish people. While living side by side with the Kurds, we faced many disputes, but there were periods that we lived in peace together. Today's struggle that we are in is between the KDP and our people and nation; this we must understand. It is between our people and a group within the KDP that controls it, i.e., the greedy aghas and tribal heads that want to control our people's lands. The latest actions by the KDP are neither in the best interest of the Kurdish people nor of the KDP. These efforts will not succeed. For thousands of years, we have protected ourselves and our identity and many previous efforts failed to annihilate this nation. The KDP and the aghas will fail too. If we look around the world we would see that those prospering nations, whether small or large, are those whose larger groups found a way to live in peace, tranquility and democracy with their lesser neighbors. The interference of the KDP in our internal affairs and using force sometimes if needed and preventing our people from achieving their national rights is a stumbling block for the Kurdish people. Dr. Malik stated that since the Sassanid [Persians], we lost our power and we were always considered as a millet by the Persians, Arabs and Turks, i.e., a religious Christian minority. These nations dealt with our people through our patriarchs and the religious leadership. We had since perhaps prior to WWI struggled to transform from a millet to a nation. True, our people are Christians and that our religion is an important part of who we are, but that is not all that there is about us. Our national rights are broader than our religious rights. Political, civic, and human rights and the right to elect our own representatives must be considered more urgent that our religious rights. Of course, this is an internal struggle within us. However, our neighbors the Kurds and the Arabs see it easier to keep us as a religious minority under their authority and administration. In 1987, the ADM was trying to be part of the northern Iraq Kurdish coalition. The KDP continued to object. In Damascus, [Syria], the ADM met with four members of the Iraqi Communist Party (ICP). Three were Kurds and the fourth was Toma Tomas, a central committee member of the ICP and well known among our people. The issue was opened again and the ADM questioned why we were left out since we were part of the opposition movement against Saddam Hussein and lived in northern Iraq as well. The ADM members were told the KDP had a veto on the ADM and that if the ADM wants to join the Kurdish coalition, it must then unite with a certain mamy [Uncle] Nisan. This Nisan was a man who did not know how to write his name, but was a member of the KDP and a border smuggler who had gathered few men around him and founded a paper like organization. The ADM message was that if the KDP wanted to have Nisan in the coalition then that is its business; however, the KDP must not order the ADM to join with this person to be part of the coalition. The message of Dr. Malik, who was present there, emphasized that if the ADM took such steps based on what others dictated and not based on what the people and the future required then he would not be part of the ADM and will oppose it. The ADM did indeed reject such demands dictated by the KDP. Since 1992, the KDP had tried to control our people and control who represents us. However, the situation or circumstances at the time were not favorable for Kurds to make such move. Today, the new situation has given the KDP a favorable opportunity to follow a new offensive strategy to undermine our true representatives and take control of that representation. This the KDP did by ignoring the democratically elected representatives and by appointing those who sold themselves to the highest bidder and to false prophets like Nimrod Baito, Sargis Aghajan, or Fawzi Hariri. The ADM has good relations with many groups in northern Iraq. Its stand from the PUK and KDP is different. This of course has to do with the presence of our people in the region and the ideology of the two groups. First, our people live mainly within the region under the KDP [and Barazani]. Very small population lives in the Sulaimaniya region under PUK [and Talabani]. Secondly, the KDP is built on tribal basis and aghast who control the KDP. These represent a backward mentality and ideology, whereas the PUK has an advanced and educated mentality and ideology. Therefore, in dealing with the two groups the ADM feels the difference between the tribal aghast who want to control our lands and the educated Kurdish nationalists who want a bright future for Kurds, but do not mind sharing that better future with our people. There is no specific reference in the political agenda of the KDP towards other ethnic groups in northern Iraq that explains the KDP's stand from these groups if and when Kurds gained power, stated Dr. Malik. That agenda does not explain the fate of these ethnic groups. Of course, there is reference to the presence of Christians. Democracy, as a word, has been ridiculed and used by everybody, but hardly practiced. Not even the United States is practicing the real meaning of the word in Iraq. The thought that we are Christians and that the United States is going to help us is a misconception. In this world, groups get what they demand in accordance to their power. We have to make our demands and rights clear and known and we must remember that rights are taken and not given. We must build our strength and unite, end our division, get rid of these false prophets, and end the destructive actions. True nationalists must work together and empower each other. We must empower ourselves and our nation in order to get our rights, but most importantly to protect and preserve them so that a day would not come where the KDP would give us a ministerial position today and take it away tomorrow and give it to a Saddam Hussein's orphan. Those among us who are under the impression that much could be expected from individuals such as Sargis Aghajan and Nimrod Baito are mistaken. They must look around themselves and analyze the situation. They must realize that we could only gain our rights through our own strength only. They are hesitant and afraid that if we did this alone we might face another catastrophe like that of WWI, Simele, or similar to what happened in Tur Abdin, Urmia, and Hakkari. So they think that may be, just may be, through such individuals who joined foreign groups we could gain our rights. The fact remains that such individuals have done nothing in such endeavor. Let us ask the few who are under such impression: Would you replace Mar Benyamin Shimun with Tariq Aziz? Would you replace Agha Petros with Tariq Aziz? Would you replace martyrs Youbert, Yousip and Youkhanna with Nimrod Baito, William Shawil, Sargis Aghajan, and Fawzi Hariri? The answer is no for sure. How many cared enough for Tariq Aziz that they contacted world governments and institutions in order to release him from prison? Do our people really care if Tariq Aziz lived or died? But our people never forgot Mar Benyamin Shimun, Agha Petros, Youbert, Yousip, and Youkhanna, who will be remembered always in our thoughts and prayers; we will remember them forever. This proves which is the path of truth; we must not be afraid of a struggle because without a struggle there is no prosperity and freedom. In our struggle, there are times when we might take steps backwards, stand still, or move forward and that is okay. We must evaluate what the ADM has accomplished with its stands, consider the support our people have given to the ADM, and compare that to what Fawzi Hariri, Franso Hariri, Tariq Aziz, or the Assyrian Ba'ath Party have accomplished for this nation. Dr. Malik stated, imagine martyrs Youbert, Yousip, and Youkhanna being taken to the guillotine to be executed. They approached singing "Bet Nahrain Atriwat leh Manshinakh" (Assyria: My Homeland, I will Never Forget You). If they while approaching the edges of death had hope and sang for Assyria and Nineveh, what is expected from our nationalists today? How could we have no hope? How could we after we knew what happened during WWI, in Hakkari, in Tur Abdin, in Urmia, in Simele … if we read our history and what happened to this nation, how could we be without hope? Imagine Holago who massacred not thousands but perhaps millions of our people. Imagine the events of 1850 in Urmia. Imagine our people in Hakkari Mountains surrounded by Ottomans and Kurds waiting to be slaughtered. In all these situations, our people never gave up. They survived and found a way to regroup, work harder, and fight for our rights. I have hope. When the ADM started 27 years ago, we had nothing; ADM had nothing. The ADM members lived under the most ruthless regime of Saddam Hussein, but they had hope and realized that if they start something they would succeed. Today, as people and nation we are being known around the world, powerful governments know who we are, we have political organizations, media outlets, thousands of students in schools learning our language as a literary and not just spoken language. We lived all this advancement in 27 years, how could we be without hope? How could we throw ourselves in the arms of false prophets and those who are selling their people? This struggle will go on. Every one of us from his own position and place must take a step and do his/her share to fill this empty earthenware [clay pot] with water one drop at a time until we fill it. Dr. Malik stressed, No, we must not give in to despair; this is a Will handed to me by my father and grandfather and I am not going to throw it away. If they had hope with all that they faced, we must have hope. If they worked, we must then work, otherwise, we cannot claim to be their offspring. Dr. Malik stated that the KDP is a powerful entity and this is something that could not be denied. It must be stressed that we are not here to attack the Kurds or the KDP. As an educated nation seeking its rights, attacks must not be our way of political communication with others. However, that does not mean that we give concessions or plead in order to gain our rights. We must display always: today, tomorrow, and in the future, an open door communication policy with the KDP, whether we agree or disagree on issues. However, and having stated that, the art of negotiation dictates that we acquire stands and draw red lines that we do not cross. These stands and red lines must be defined, drawn and communicated with those we are in struggle with. Such red lines include, for example: First, this struggle is not between the KDP and the ADM; it is a struggle between the KDP and our people and nation. Second, our people will not accept that foreigners, including KDP, Khalil Zad, President Bush, or Tony Blare to tell us who, or appoint, our representatives; we must have freedom to select our own representatives. If we do not draw lines such as these, our negotiations with others would be useless because they would know that if they push us we will always withdraw and take a step backward and that does not help our cause. Dr. Malik asserted that we must first make a decision for ourselves and that decision is that we will never give up on our rights. Second, we must make it clear that we will not accept false prophets that the KDP had appointed as our representatives. The KDP could install anyone they wish; however, we are going to reject their choices. Lets put it this way, this bride is not our bride; it is the KDP's bride no matter how expensively they dress her up, give her the best make-up, and parade her with music… she is still ugly in our eyes. We must not back off from such lines…We must stand firm with our stands and say that Tariq Aziz was not our representative and that these new versions of Tariq Aziz are not our representatives, and each one of us must deliver this loud message to the KDP, the Shi'aa, Kahlil Zad, and to our people. Our political organizations must come forward and let the world know where they stand from what took place in the last couple of weeks. We must end the division that arises from arguing trivial issues. We must concentrate on essential and crucial matters facing us today. If one organization rushed to sent a message to the Shi'aa rejecting those from our people who won in the elections and propagated that on its satellite TV station, it must be the first today to send similar messages to the KDP that it has no right to appoint our representatives. We must never marginalize our elected representatives or allow and accept those who have been appointed by foreigners. Dr. Malik asserted that what happened [with the appointments for the KRG and Iraqi Central Government] was an awakening. The KDP is testing the ADM and our nation with these unfair actions. The KDP wants to scale our power and resolve, scale our abilities, our readiness to stand on our own, and to measure how fast we would give in and whether we would bend or not. There is no doubt that if we stood firm, we could return to the negotiating table and reach an understanding because we are neighboring peoples and they cannot force us out from our ancestral lands or deny us for ever. It is not hard to imagine our strength when standing alone or standing together. It is puzzling how when the knife reaches the bone, wondered Dr. Malik, I could sit there and slap my brother; it is just not reasonable or logical. We all must take a stand from what just occurred in Iraq, including our political organizations. We must find answers that work. Dr. Malik asked: should we join the KDP? Is Sargis Aghajan the right bridge and the path to gain our rights? If that is the case, let us all be bridges for the KDP, but if that is not the case, then let all of us take and show a stand. After we all take a stand, that stand will be the foundation for a unity. Then, we need a strategy, a strategy as political organizations and as a nation. This strategy must be based on how to bond with each other. The bigger parties must welcome the smaller ones with open arms and the smaller organizations, if patriotic that is, must be prepared to express consent and work with the larger organizations and seize these futile arguments of my share and your share and my position and your position. Today, the KDP is sticking its finger in the eyes of our nation. It is time to put the silly arguments aside and cooperate to resolve much important issues facing our nation. We must be ready to put persons and organizations where they belong and force them to return to the path of unity and cooperation. Multi party system is a preferred path; however, the ADM has a very special and leading place in our politics and we must realize and admit that. It is not necessary that one must be a member of the ADM to be active; however, we must reach an agreement. If we agree on 60% of the issues facing our nation and disagree on 40%, there is no reason why we could not work together on the 60% that we agree on. Most importantly, we must understand that what is happening recently must not be viewed as those pro or against ADM. We must not be involved in internal and useless arguments while ignoring the essence of our national cause, which is now a target of a vicious campaign. Mar Abdisho, or as he was more commonly known, Bar Brikha, was born in the middle of the 13 th century A.D. on Beth-Zabday island in the Tigris River by the junction of the Syrian, Iraqi and Turkish border. He died in the year 1318 A.D.
Mar Abdisho lived a good portion of his life as a devoted monk at the Monasteries of Mar Akha and Mar Youkhanna (John) near the island of Beth-Zabday, which is known for the Arab/Islamic occupation as Jazerat Ibn-Omar. The Church of the East established many schools in the early centuries of Christianity in Nsibin/Nsibis and in Urfa/Edessa. Unfortunately, these schools did not survive due to the geopolitical situation at the time, and so our scholar received most of his education in the Monasteries by the priests and deacons. Mar Abdisho’s desire of learning put him ahead of his contemporaries, not only in theology but also in our Syriac/Assyriac language. As a matter of fact, Mar Toma Audo, an Assyrian of Tkhoma and a Chaldaean Rite by denomination, wrote one of the best dictionaries of the Syriac/Assyrian language, and said in the introduction that the death of two men, Mar Abdisho and BarHebraeus, meant the death of our language, as they had such great fluency and eloquence in the Syriac/Assyrian language. Mar Abdisho was ordained as a Bishop of Shigar/Singar and Beth-Arbaye, Tur Abdin in the year 1285 A.D., by His Holiness Mar Yaheballah III Bar Turkaya (of Turkish origin). Six years later (1291A.D.) he was ordained by Mar Yaheballah III again to be the Metropolitan of Soba/Nsibin and Armenia until his death in the year 1318 A.D. His death signaled the end of one of the brightest chapters in the history of the Assyrian Church of the East. After the fall of Nineveh in 612 B.C. at the hands of the Medes, the Assyrian power diminished except as a client kingdom of Adiabene (Erbel), which lasted up to the Arab/Islamic invasion and occupation in the middle of the seventh century A.D. In any event, Assyria went through many occupiers starting from the Medes, the Persians, the Greeks, the Romans, the Arabs and the Ottoman Turks. Mar Abdisho, as previously stated, was born in the middle of the 13 th century A.D. (we do not know the exact date), during days of the last Abbasid Caliph by the name Al-Mustas’sim (1242-1250 A.D.) who fled Baghdad to Egypt. In any event, the tension grew between the Arabs and the non-Arabs due to these circumstances, and the Arabs became uncomfortable when foreign nationalities came to power and made a mockery of them as a savage people. The Arabs, in response, called these people ‘Shu’ubeyya’ or the “anti-Arabs” who believed that the alien converts were equal to the Arabs themselves. The Arabs tried to exhibit their superiority and put their pride in the holy book, the Qur’an, and in the superiority of their Arabic language, where people of eloquent ability appeared in this period and came up with poetry that could challenge their adversaries. One of them was known by the name al-Hariri al-Basri (Abu Muhammed Al-Qasim bin Ali, 1054-1122 A.D.) who is the author of a very artistic book which is called The Maqamah, a typical expression of the Arabic spirit in rhymed prose. As a challenge to the Arabs and at the request of His Holiness Mar YahebAllah III, our scholar wrote “Pardisa d’Aden- Maqamat”. Our Metropolitan Mar Abdisho made a mockery of the Arab verses and poetry and described them like as “calcified graves” which look pure and clean from the outside, while from the inside are rotten. He further said: “Men of the Arab origin with a high degree of eloquent ability made a mockery of our poor language, which cannot be considered as rhetorical as their Arabic language, and for that purpose I embarked in writing this book of ‘Pardisa d’Aden- Maqamat’ in which I included fifty verses”. Our scholar spared no time to come up with something that made Arabs stand in awe, and I am sure they will have a very tough time to matching it. It is worth mentioning that the current Arab scholars consider the al-Hariri Era as the “Decline of the Arab Literature” or ا لانحطاط عصر ‘, because the people who had poetic ability were losing the true and sincere expression of such artistic poems. In any event, our people never thought to take such a path, and “Pardisa d’Aden- Maqamat” was a mere a reaction to the Arabs who were trying to make mockery of our language. It is also worth mentioning that another Monk by name Dawood al-Homsi( 1490 A.D.) from Central Syria attempted to copy our scholar , but his work was in no way to comparable to Mar Abdisho’s accomplishment - glorifying our Syriac language. Mar Abdisho said in his introduction of his book “Pardisa d’Aden- Maqamat” that he had written about 19 books and titles in the Syriac language, and one in Arabic entitled “Shahmarwareed”. Unfortunately, today we only possess four of them, the Maqamat/Pardisa D’Aden, the book of Marganitha/Jewel on the truth of Christianity and two books of canon laws - thanks to zealot Assyrians who copied and printed these works. “Pardisa D’Aden-Maqamat” was printed in 1916 for the first time in Urmia, Iran, and printed a second time by the late Reverend Yosep D’Qaletha and the Assyrian Press of the Church of the East in Mosul/ Nineveh, Assyria/Iraq in 1928. 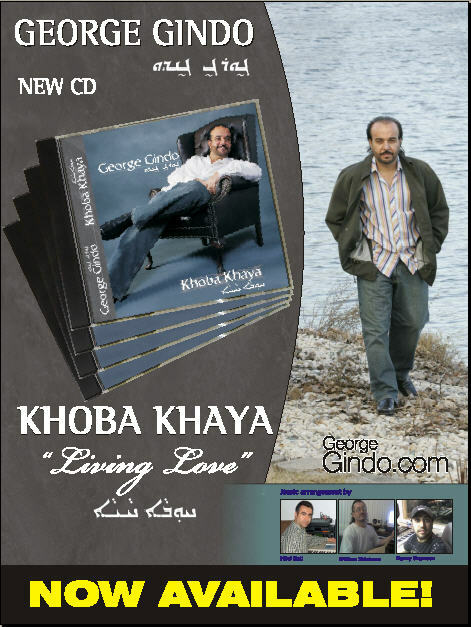 The last printing was in 1988 by the Reverend Kako Lazar in Chicago, Illinois. The other materials are kept in archives of the Assyrian Church of the East and in the Vatican archive library in Rome, Italy. This book was written in response to the Arab challenge, and is comprised of fifty verses in two volumes; each volume comprised of 25 verses. Let us see what the author did by presenting some samples of his works. ܐܡܪ ܫܒܚ ܐܪܒܥ ܕܐܡܠܟ ܟܠܡܐ ܕܥܒܪܐ ܚܒܫ ܪܡܐ. In order to be acquainted with the book, one must read all fifty verses to fully understand his riddles. We, the Assyrian people are proud to have a personality such as Mar Abdisho, respected by our masses, as he left an unforgettable legacy of achievements as a scholar. “The eloquent style of Mar Abdisho surpassed everyone, because he elaborated on many themes of “Bar Brikha” (which means the “son of the blessed one”) and used the name in a metaphorical way.” He was, indeed, the blessed one and great in his writings … and our literature started and ended with him personally, God bless his soul that his memory will live on from one generation to another, Amen. The Baklava war ( in Lebanon Baklawa) intensified between the Turks and the Cypriot Greeks. Turkish baklava producers are protesting Greek Cypriot claims that the sweet dessert is their own national creation, baklawa hadaf.jpg with support for their protest coming from State Minister and EU Chief Negotiator Ali Babacan in the EU General Secretariat. Plans for a press conference are underway for Monday May 16, and tomorrow a protest in which banners proclaiming "Baklava is Turkish, we will not allow the Greek Cypriots to feed it to the world" are held is planned for Istanbul. The owner of renowned baklava producer "Haci Sayid Baklava," Halil Dincerler, had this comment on the situation: "Baklava is Turkish, what the Greek Cypriots are presenting is just a copy. We will go all the way to Brussels, and we will let the EU ministers taste real baklava." Another comment on the international food fight was made by the President of the Baklava and Dessert Producers Foundation, Mehmet Yildirim. He said that it was time for Turkey to stand up and claim its national treasures, and recalled that the Turks had brought baklava with them all the way from Central Asia. Yildirim also said that there were documents which proved that baklava belonged rightfully to the Turks. To help our readers Ya Libnan did some research on Baklava to determine the real origin of this dessert and to help stop this sticky war! 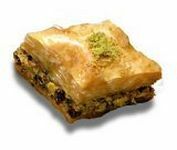 Like the origins of most recipes that came from Old Countries to enrich the dinner tables of dessert lovers, the exact origin of baklava is also something hard to put the finger on because every ethnic group whose ancestry goes back to the Middle East has a claim of their own on this scrumptious pastry. It is widely believed however, that the Assyrians at around 8th century B.C. were the first people who put together a few layers of thin bread dough, with chopped nuts in between those layers, added some honey and baked it in their primitive wood burning ovens. This earliest known version of baklava was baked only on special occasions. In fact, historically baklava was considered a food for the rich until the mid-19th century. In Turkey, to this day one can hear a common expression often used by the poor, or even by the middle class, saying: "I am not rich enough to eat baklava and boerek every day". In the 15th Century A.D., the Ottomans invaded Constantinople to the west, and they also expanded their eastern territories to cover most of ancient Assyrian lands and the entire Armenian Kingdom. The Byzantine Empire came to an end, and in the east Persian Kingdom lost its western provinces to the invaders. For four hundred years from 16th Century on, until the decline of Ottoman Empire in 19th Century, the kitchens of Imperial Ottoman Palace in Constantinople became the ultimate culinary hub of the empire. The artisans and craftsmen of all Guilds, the bakers, cooks and pastry chefs who worked in the Ottoman palaces, at the mansions of Pashas and Viziers, and at Provincial Governor (Vali) residences etc., had to be recruited from various ethnic groups that composed the empire. Armenian, Greek, Persian, Egyptian, Assyrian and occasionally Serbian, Hungarian or even French chefs were brought to Constantinople, to be employed at the kitchens of the wealthy. These chefs contributed enormously to the interaction and to the refinement of the art of cooking and pastry-making of an Empire that covered a vast region to include the Balkans, Greece, Bulgaria, Yugoslavia, Persia, Armenia, Iraq and entire Mesopotamia, Palestine, Egypt, North Africa and the Mediterranean and Aegean islands. Towards the end of 19th Century, small pastry-shops started to appear in Constantinople and in major Provincial capitals, to cater the middle class, but the Ottoman Palace have always remained the top culinary "academy" of the Empire, until its end in 1923. Here, we must mention that there's a special reason for baklava being the top choice of pastry for the Turkish Sultans with their large Harems, as well as for the wealthy and their families. Two principal ingredients, the pistachio and honey, were believed to be aphrodisiacs when taken regularly. Certain spices that were added to baklava, have also helped to fine-tune and to augment the aphrodisiac characteristics of the pastry, depending on male or female consumer. Cinnamon for females, and cardamom for males and cloves for both sexes. From 18th century on, there was nothing much to add to baklava's already perfected taste and texture. There were however, some cosmetic modifications in shaping and in the presentation of baklava on a baking tray (called Sinii). The Phyllo dough (called Youfka) which was traditionally layered and cut into squares or triangles, were given a "French touch" in late 18th century. As the Empire began opening itself to Western cultural (and culinary) influences, the General manager (Kahyabasi) of the Imperial Kitchen didn't miss the opportunity to hire Monsieur Guillaume, a former pastry chef of Marie Antoinette, who in exile at the Ottoman Turkish Palace after learning how to bake baklava, created the "dome" technique of cutting and folding of the baklava squares which was named "Baklava Francaise" (French Baklava) after the nationality of its creator. Based on the above history it is clear that Assyria is the origin of the Baklava. The Assyrian empire stretched from Southern Lebanon in the south to the Zagros mountains in the north( bordering present day Iraq and Iran) and included areas of present day Turkey, Iran, Syria and Iraq. The heartland of Assyria is the area that is now dominated by the Kurds. Baklava , in fact has been the sweetest unifying dessert between all the countries of the Middle East and the Mediterranean sea. Each country makes it its own way but they are all sweet and sticky. 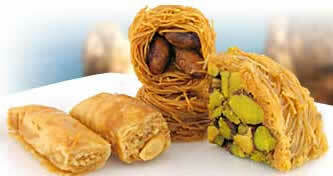 Lebanon has been the leader in promoting Baklava throughout the world. Lebanese baklava bakers such as Samedi were the first to Franchise it in the Gulf region, Europe and throughout the Middle east. In the United States the most famous Baklava is made by Shatila in Michigan. As Lebanon continues to promote this dessert it will become the ultimate original Baklava. Turkey and Greece therefore should stop this crazy Baklava war, because they both copied the dessert, but Lebanon did a better job at copying. One baker told me after hearing the history of the dessert " You know, I never though about this before, but since Lebanon was at one time part of the Assyrian empire...perhaps Lebanon was the origin of this dessert and the Assyrians copied it from us and then passed on the recipe to the Turks and Greeks !!" I was not surprised to hear this from the Lebanese baker and will comment no further since we had enough wars in Lebanon and we don’t want to start another one with Turkey and Greece. 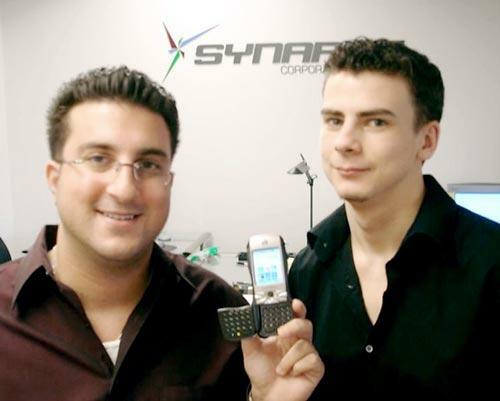 Mark Michael, left, and Daniel Rust are founders of Synapse Corporate Solutions. (ZNDA: Seattle) Seattle-based Synapse Corporate Solutions sells a suite of Web-based software tailored to small and medium-sized businesses. It was founded by Mark Michael and Daniel Rust and currently has five employees. Mark Michael is the son of Mr. Ashur Michael and nephew of Sargon Michael (and Alice Baaba) of San Francisco. Michael and Rust, now 23, met in high school in Richland. Rust was president of the school's computer club, and the two started talking with other friends about developing a search engine focused on travel. The result was BopLop.com, which ran for a little more than a year before the group closed it. On to college: The effort lit the entrepreneurial fires of Michael and Rust, who went on to Central Washington University. They wanted to drop out to build a business, but their parents, not surprisingly, weren't too pleased with the idea. So they started Synapse just before graduating in 2004 and moved to Seattle to focus on the company. Now, Synapse offers 14 Web-based programs that can be used independently or in connection with each other. The applications include a service appointment scheduler, a Web traffic-reporting tool and a customer-billing program. "Small businesses still just don't know the true power of what a database or a Web-based application can do for them," says Michael. "Or they think that maybe it's too complex for them. Ours is easy to pick up and use right away." Synapse has not accepted venture funding and has no plans to. The company is profitable, Michael said. Synapse is building two more applications. One is similar to a scratch pad for budgets, Michael said, and the other is a peer-communication tool. This fall, the company plans to expand its focus to consumers and allow its applications to be used on mobile devices. The company recently released "Synapse Wine," software for wineries. The programs can manage wine-club members, subscription data and inquiries. The ultimate goal? Not to have a "castle in the sky," Michael said. "We want to really have a legacy, hands down." ZINDA Magazine is published weekly. Views expressed in ZINDA do not necessarily represent those of the ZINDA editors, or any of our associated staff. This publication reserves the right, at its sole discretion, not to publish comments or articles previously printed in or submitted to other journals. ZINDA reserves the right to publish and republish your submission in any form or medium. All letters and messages require the name(s) of sender and/or author. All messages published in the SURFS UP! section must be in 500 words or less and bear the name of the author(s). Distribution of material featured in ZINDA is not restricted, but permission from ZINDA is required. This service is meant for the exchange of information, analyses and news. Any material published in Zinda Magazine will not be removed later at the request of the sender. For free subscription to Zinda Magazine, send e-mail with your name, address, telephone number to: zcrew@zindamagazine.com.